The Union finance Ministry has removed the Goods and Services Tax on services provided by Indian service providers for transit cargo such as transportation, insurance, shipment, container freight station and cargo handling charges, among others. The government has responded to request of Nepali traders who handle transshipment operations in India using the Indian currency. They have urged the Indian government to exempt them from payment of GST. Issuing a notification, the Finance Ministry announced the GST waiver for transit cargo considering these services provided by the Indian service providers as �service export�. A spokesman of the Commerce Ministry confirmed that India has waived the GST on supply of services associated with transit cargo to Nepal and Bhutan (landlocked countries) through a recently published Gazette notice. Since the Indian government introduced the GST, services like transportation, cargo handling and container freight station had become costlier as the GST rule recognised and exempted GST only if the service procurer made payment in convertible foreign currency. Though GST is not applicable on export of goods and services, it recognised service export only if the Indian supplier received payment in convertible foreign currency. 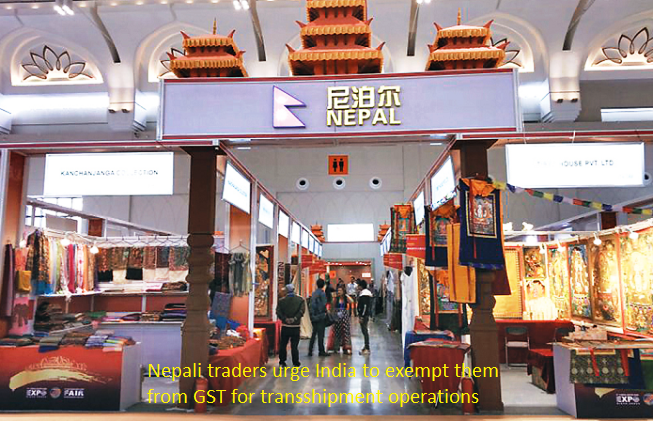 Nepal had requested the Indian government for GST waiver citing that services procured by Nepali traders in India should be taken as service export. The central bank of Nepal encourages traders to make payments in Indian currency for transactions in India to prevent chances of embezzlement of convertible foreign currency such as US dollar by Nepali traders. Nepal has requested GST waiver for all services procured by Nepalis in India, like software, business process outsourcing, knowledge process outsourcing and other technical services as well. However, India has amended GST rules only for services related to transit cargo that includes road and rail transportation, shipping line charges, cargo handling charges, among others.